Funko has a army of vinyl figures on store shelves right now and it doesn’t look like they are going to stop any time soon. The group has covered comics, Disney, Star Wars, wrestling, television shows, and horror movies. There are solicits for new figures all the time and I usually don’t mention them unless they really stand out to me. 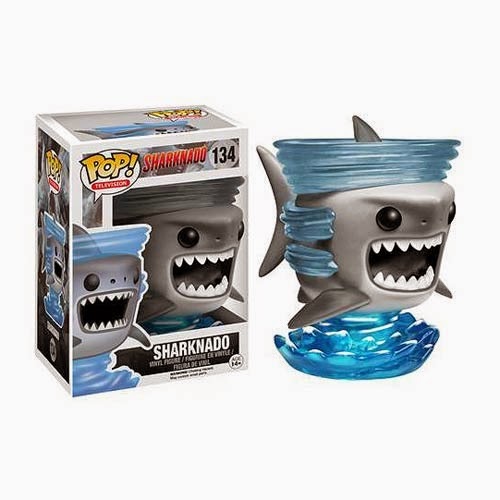 Well in June Funko is releasing a Sharknado. A tiny shark suspended in a tornado that you can place on your desk or shelf. It’s adorable. I might need it. I probably need it. It’s good timing of course, because Syfy will be debuting the Sharknado sequel this summer; the amazingly named “Sharknado 2: The Second One”. Just as everyone is talking about the movie the vinyl figure will be showing up on store shelves. It’s almost like they planned it that way. I still think Sharktopus is superior to Sharknado, so I hope that Funko one day sees things my way and gives us Pop! Sharktopus.